We did it! We explored our world. Now it's time to Explore Our Earth! 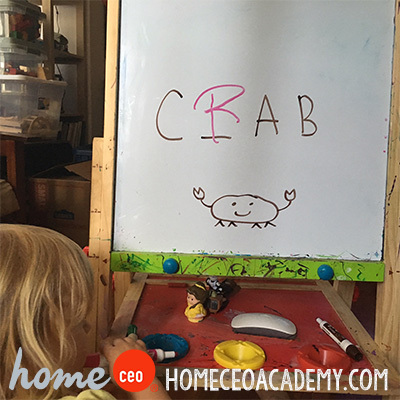 Home CEO's second semester is a nine week program that explores oceans, mountains, rain forests, and so much more! 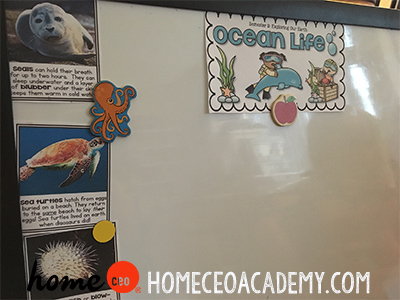 Below are some pictures from our first week where we studied ocean life! A new semester means new classroom decor! Did you know "Twinkle Twinkle Little Star" had three verses? Neither did I! There are focus questions at the bottom of each poster. I plan on adding a few to Kylie's bedroom each week. Drawing has never been my strong suit, but Kylie got the idea with this wake up, warm up language activity. We practiced hand writing with an ocean themed twist. You save me from washing when we have many people over for dinner. You're endless craft opportunities make you a winner. Paper plates, I love you. 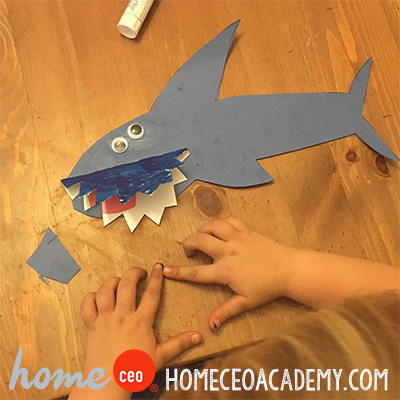 The "official" craft activity for this unit was a shark, but we also made a squid, crab, octopus, and a Captain America shield. We had the pleasure of making Encouragement Elves this week! 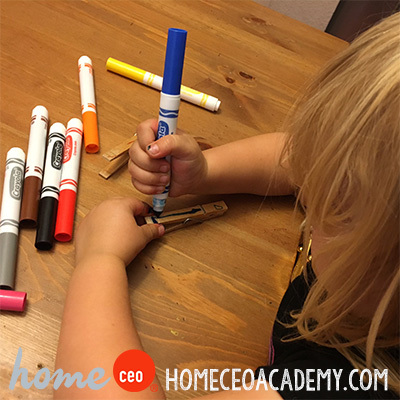 Encouragement Elves is a monthly service project aimed at teaching your preschooler math, fine motor skills, and gratitude. We made clothes pin magnets this week and gave them to our friends at the Post Office. The second semester brings us a new, weekly activity- Word Family Reunion! The Legend of the Lost Words is the story of 18 word families hat went on vacation on a ship. A store comes and everyone is thrown overboard! 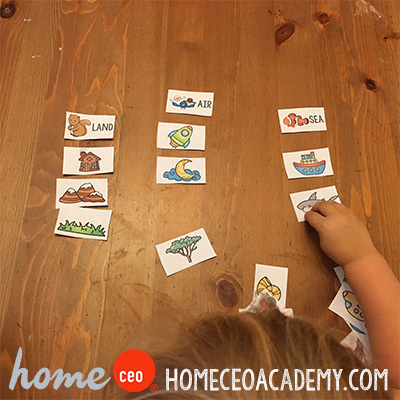 Your little learned is tasked to find all of the word families during the course of the semester and complete the puzzle on the bottom left of the board. 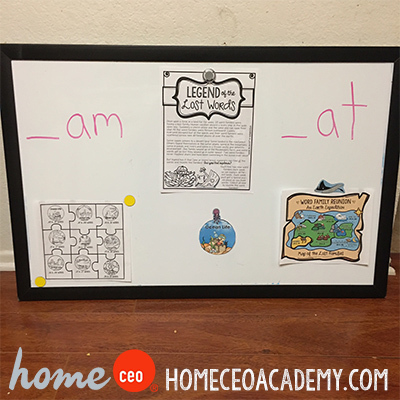 This week, we were on the look out for _at and _am words. Day two of our language lesson had Kylie building words. A new semester means a new notebook! 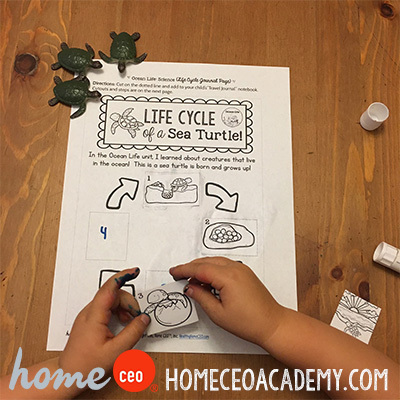 Instead of cooking during our science block this semester, we are learning about life cycles. We learned about how sea turtles came to be! We also had fun classifying land, air, and sea items during our science block. 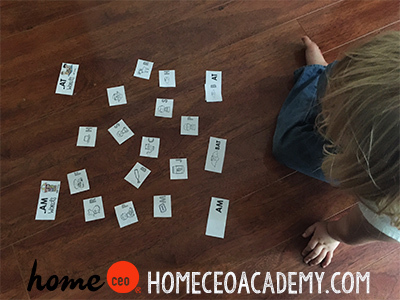 Kylie is currently obsessed with playing Simon Says, so even though there are no pictures, trust me when I say that the gross motor flash cards this week make for a great game of Simon Says. The first week of our second semester is in the books! 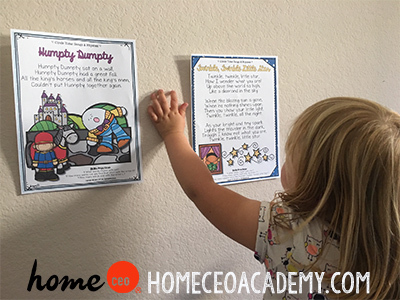 If you want to come along and learn with us, you can pick up our nine week "Exploring Our Earth" curriculum bundle here.